It only provides CFDs and FX. It is regulated only by the Cypriot and the South-African regulators. 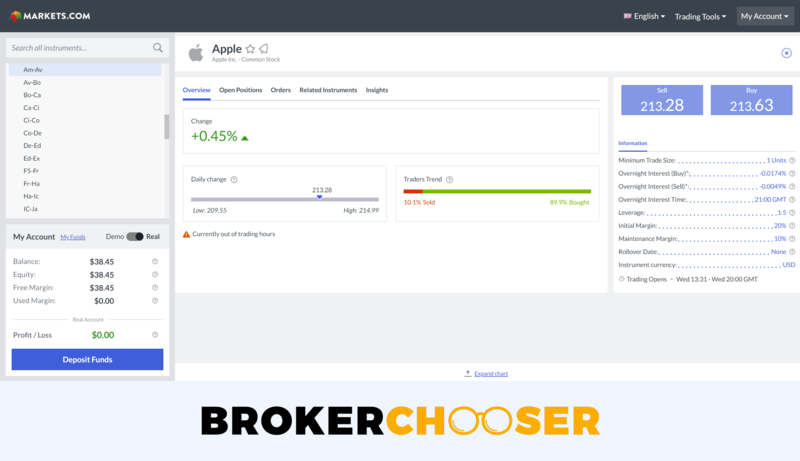 We compare Markets.com fees with its peers, Plus500 and eToro. When you are an average investor it is extremely hard to figure out Market.com’s fees. There is no dedicated fee description on its website. Markets.com fees are low for stock CFDs and high for forex. There is no commission, everything is included in the spread, the difference between the ask and the bid prices. Here is the verdict. Markets.com stock CFD trading fees are low, and FX fees are high. Markets.com's yearly financing rates are high. 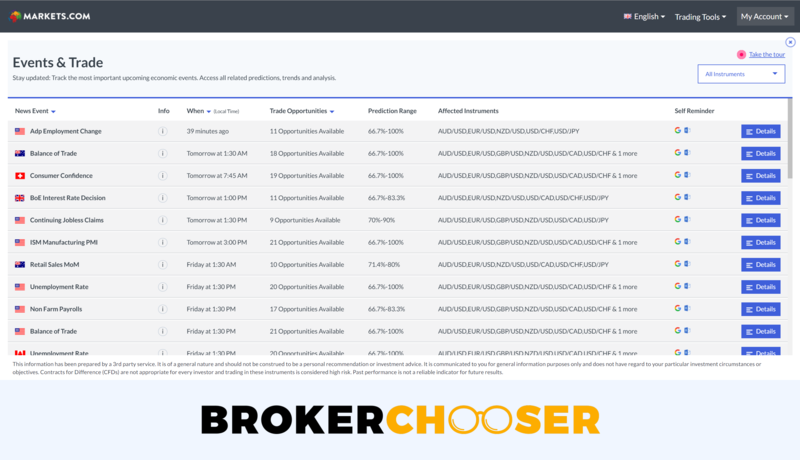 Brokers charge financing rates if you hold a leveraged position for more than one day. This can influence your trading fees very much if you tend to hold positions for longer. Markets.com financing rates are only published on the trading platform, and the calculation method is not transparent. Markets.com can also change the rates anytime at its discretion. Markets.com has low non-trading fees. There is no inactivity fee, account fee, deposit or withdrawal fee. Markets.com accepts customers from almost all countries. There are a few exceptions. Some notable exceptions are the citizen of US, Canada, Australia, New-Zealand, Hong Kong, Japan, South-Korea, Israel, Russia, Brazil, Turkey, and Belgium. The minimum deposit is $/€/£100. 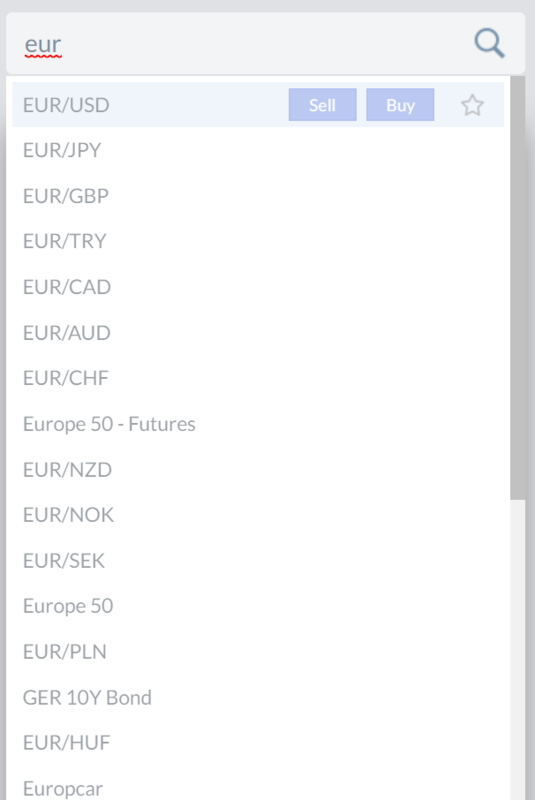 Markets.com has only one, standard account type. The account opening is very easy and fully digital. It took one day until our account was approved. Give your personal and financial information. Give your trading experience and fill out a test on your knowledge. Verify your ID and residency. You can upload national ID, passport, or driver's license for verifying your ID. Utility bill and bank statements are accepted for residency verification. There are a lot of base currencies: USD, AUD, DKK, EUR, GBP, NOK, PLN, SEK, and ZAR. 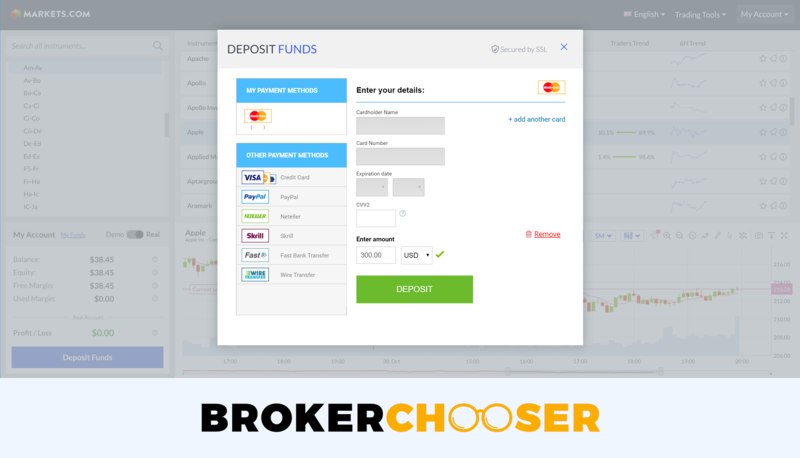 Markets.com deposit is free of charge. The bank transfer can take more business days, while electronic wallets and credit/debit cards are instant. Markets.com withdrawal fee is free of charge. This is very competitive. Withdrawing money is easy. Funds can be withdrawn in the same way as deposited. The quoted withdrawal time was 7 days, that is not the fastest. We tested the card withdrawal and we received the money in 4 business days, less than the quoted. You can only withdraw money from sources which are on your name. 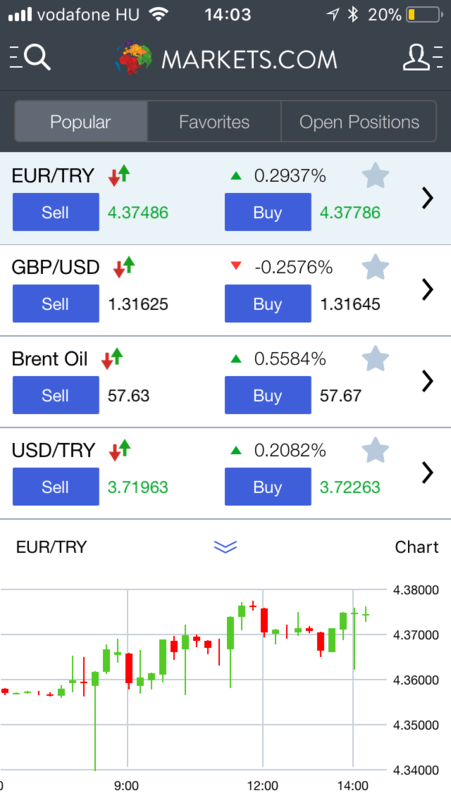 At Markets.com you can use its own platform, or you can use MetaTrader 4 and 5. We tested Markets.com trading platforms. The web platform is available in 15 languages including English, French, German, Spanish, Italian, Greek, Russian, Arabic, Dutch, Norwegian, Finnish, Swedish, Danish, Polish, Czech. The mobile platform covers even more languages including e.g. Hungarian, etc. Markets.com web trading platform is easy to navigate around. Its design is good, it got upgraded in 2018. However, you cannot customize the platform. 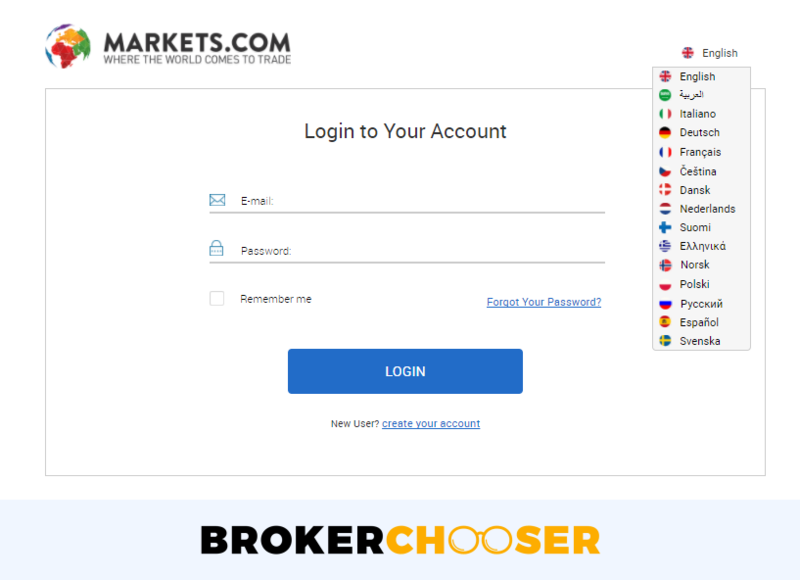 Markets.com applies a one-step username / password login. Brokerchooser was missing a more secure two-step authentication. The search function is great. You will find easily everything. We searched "Apple" "Japan" and "Oil" and managed to get the relevant results quickly. You can also browse by categories. You can select for example stocks from South Africa, or have the "Top Volatile"s lined up by a few clicks. Markets.com order panel is simple and clean because there are not a lot of functions built in. If you keep the platform and the default mode and do not change to the advanced mode, you only see market order. You can find a short explanation of the order types in our guidebook. We also liked the alert and notification function. You can set up email, SMS and push notifications. You could set an alert for the same price level and circumvent this. However, there is no way to set a notification for order confirmation. The portfolio and fee reports are clear and easy to access. E.g. it is clear how much financing rate you paid. It is a bit confusing that in the statement, funds and withdrawals are added to profits and losses. This makes the statement a bit hard to read. The Markets.com mobile platform looks nice and it is easy to use. There are only basic order types, two step login is missing, and you cannot setup an order confirmation. Markets.com operates mobile platforms both on iOS and Android. The mobile platform is very similar to the web platform. It looks nice, and you can easily get around. There is a great onboarding when you first log in, and after a few minutes, you will be good to go. Furthermore, the search function is great. However, there is no two-step login, there are only a few order types. You cannot set up notifications. 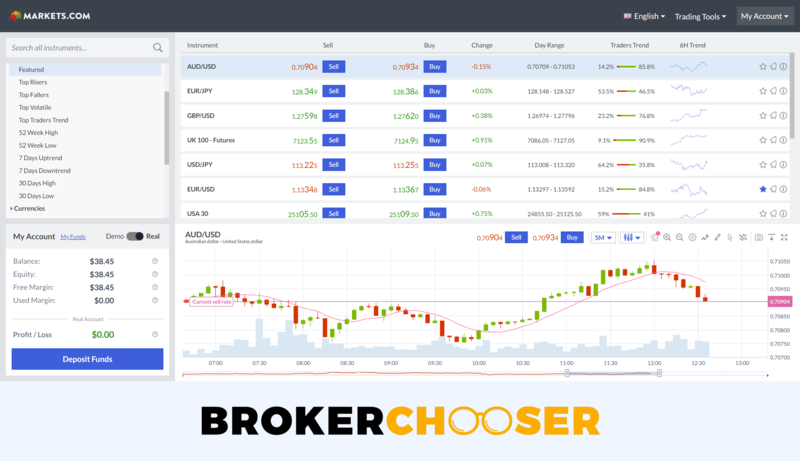 Markets.com is a CFD and forex broker. To learn more on CFDs read our CFD trading tips. Markets.com has a competitive FX offering, but the CFDs are not the best. There are a few cryptocurrencies: Bitcoin Futures, Ripple, Ethereum, Dash, Bitcoin Cash and Litecoin. Based on the customer support answers, you cannot change the default leverage level of the products. We think you should be in control of this. Markets.com offers CFD Blends, which are practically more CFDs organized along themes, like "legal cannabis", "trade war losers" The composition of the CFD portfolios are clear and well disclosed, also its past performance. We liked this function. Markets.com provides great research tools, including recommendations, sentiments and a good charting tool. Fundamental data is missing. Analyst recommendations for stocks, bonds, etc. Markets.com research tools are available in all 15 languages the platform is available at. This is great. There are a lot of recommendations you can use at Markets.com. These recommendations are clear, stating both the direction and in some cases the target price. They do not provide argumentation behind the recommendations. Most of them are provided by TipRanks, a 2012 founded startup. You can find recommendations from analysts. They are from top-tier bank analysts (UBS, Merrill Lynch etc.) and they give recommendations on shares. Also, a good feature that analysts are ranked based on their past performance. You can also see what bloggers on SeekingAlpha or MotleysFool write about a few stocks. There is also a Hedge Fund sentiment. It shows the insiders, e.g. management or other stakeholders what trade with a stock. There is a menu for fundamental data, but there is no real fundamental data, like financial ratios or historic financial reports. Markets.com's charting tool is good. Besides the basics, you can add plenty of indicators. For a few stocks, you can access Trading Central's technical recommendations. Trading Central is a third party technical analysis firm. You cannot save your chart settings. There is no real news feed. All the news you get is through the economic calendar. There is also a pop-up alert when Markets.com thinks something newsworthy is happening. Sadly, you cannot set alerts manually. How does the economic calendar work? Beyond the listing upcoming events, you can also see the currency pairs the events influence. Furthermore, you can see whether the FX pair out or underperformed the consensus after a similar economic event. Let’s see an example. The UK GDP YoY growth rate report is an economic event. 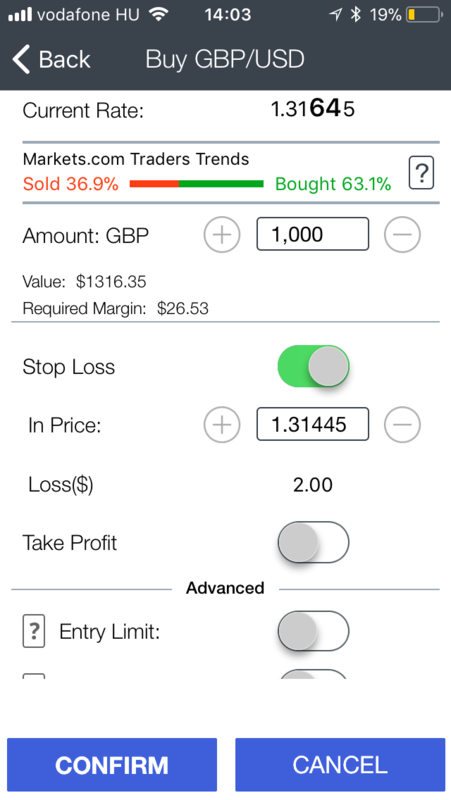 With the tool you can investigate the effect of the GDP report on the GBPUSD. You can hit trade straight away. This is by no means a bulletproof advice on how to trade currencies. Still, it is a handy tool. Markets.com customer service is great. You can contact them on all channels. The answers are relevant and fast. However, you can only reach them on weekdays. The customer service is available in multiple languages. We know about English, German, Spanish and Italian. Markets.com's customer service was always quick and reliable when we tested it. E.g. when we asked about fees, they talked about the financing rate too. You can rate your agent, a good way to give feedback. The tone was also nice. You can call a local phone number, so there is no need for an international call. On the flip side, the customer service cannot be reached on the weekends, it is 24/5. Markets.com's education is good. There is a demo account. You can sign up for regular webinars about trading and also watch tutorial videos. You can practice on the demo account and that is a good way to learn. There are quite a few videos in the Knowledge Centre. There are platform tip videos. 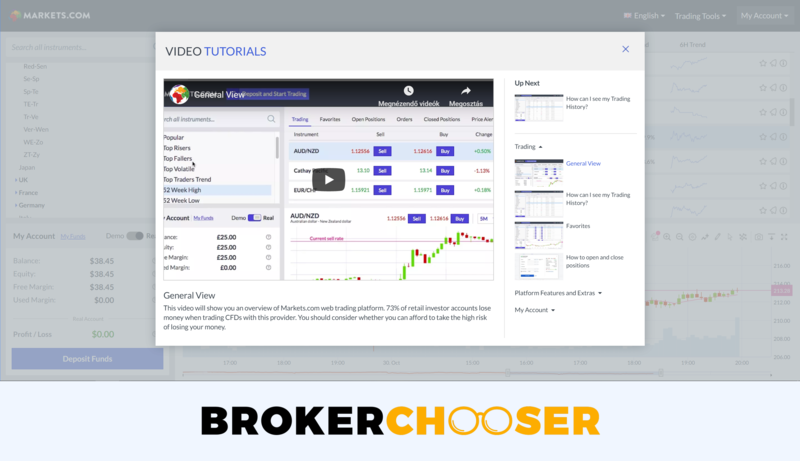 A Canadian trader hosts short videos about trading tips and also makes some longer, 60-minute videos on special topics, like trend signals. Markets.com's parent company is listed on the London Stock Exchange. This is a good sign. However, it is only regulated by the Cypriot and the South African regulator, and not by the FCA or other top-tier ones. Markets.com is a Cypriot broker established in 2010 serving clients globally. Is Markets.com safe? To be certain, it is best to check two things: how you are protected if something goes south and what the background of the broker is. Markets.com is regulated in Cyprus and South Africa. Clients from all countries, except South Africa benefit from the Cypriot investor protection, in case Markets.com defaults. Cyprus has more online brokers than its global economic strength would suggest. Allegedly, because of its relaxed regulation. Being regulated only in Cyprus is not the best sign when it comes to a broker’s safety. Markets.com provides negative balance protection. This means you cannot lose more than what you have in your account. Markets.com's background is a bit complicated. Playtech, a gambling software company, acquired TradeFX in 2016. TradeFX owned Safecap Investments Limited, the Cypriot firm which operates Markets.com. Hence, Playtech is the owner of Markets.com. Playtech is listed on the London Stock Exchange. This is a good sign as companies listed on major exchanges need to be transparent. 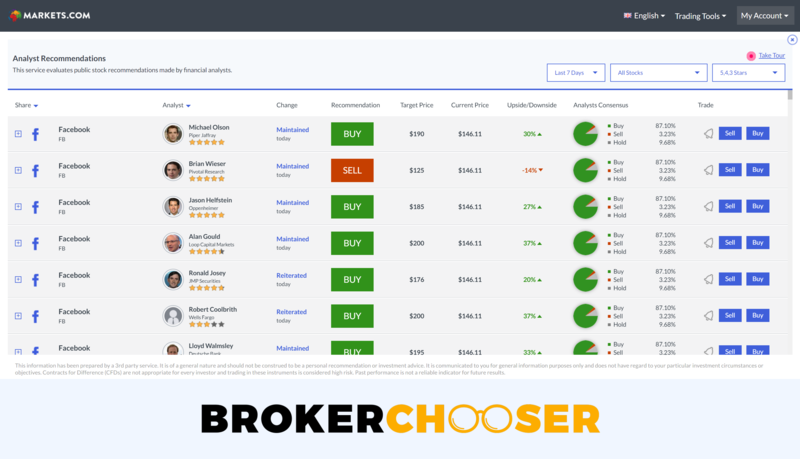 Markets.com has done significant steps to become a transparent broker. The sheer fact that Markets.com owners are transparent shows Playtech's efforts. There is also a good press coverage on how Markets.com is transforming its business to be more diligent. Nevertheless, keep in mind that Markets.com is neither regulated by the stringent UK regulator, nor is listed directly on an exchange, nor discloses its financials transparently and regularly. These factors would show more transparency and regulation quality. Markets.com's parent company, Playtech is listed on the London Stock Exchange. This is a good sign for Markets.com's safety.